Summit’s Blue River Basin recorded snowpack near the 30-year average, and the six speakers at the 22nd annual State of the River meeting on Tuesday, May 5, stressed that local residents should feel fortunate that the headwaters community was spared the immediate water supply problems others are facing around the West. However, the event’s speakers also emphasized the coming impacts of long-term drought and overconsumption on Summit and other communities that supply the majority of the West’s water. County Open Space director Brian Lorch and Blue River Watershed Group board treasurer Jim Shaw said restoration projects on the Swan River northeast of Breckenridge and the Tenmile Creek east of Copper Mountain are moving forward with success. Summit County water commissioner Troy Wineland said Summit’s snowpack didn’t quite reach average this winter, according to data from the Blue River Basin’s four SNOTEL measuring sites. Half of the snowpack arrived in November and December, and it was gone at lower and middle elevations by the end of March, which was unusually dry and warm. Runoff started sooner this year, and Tenmile Creek flows in early April were five times greater than average, Wineland said. He predicted peak runoff will occur in early June depending on the weather. On Monday, May 4, Wineland said Old Dillon Reservoir achieved its first complete fill of 303 acre feet. The reservoir is jointly operated by the county and the towns of Silverthorne and Dillon, and it was stocked with golden trout from California that Wineland said should mean good fishing in the next year or two. He answered a question about Antero Reservoir in Park County, which Denver Water will empty this summer ahead of repairs to the 100-year-old dam. The phase that requires draining the reservoir should be done by the end of 2015 with refilling beginning next spring. Steger also said Denver Water is still working on a permit to enlarge Gross Reservoir in Boulder County. Ron Thomasson, a hydrologist with the U.S. Bureau of Reclamation who oversees Green Mountain Reservoir operations, said runoff flows won’t be high enough this year to allow coordinated reservoir operations that would protect endangered fish on the Colorado River. Kuhn presented last and detailed continued threats facing Lake Powell and Lake Mead operations. Allowing Lake Powell’s water level to fall below the amount needed to generate electricity would lead to dramatically higher utility bills costs, the elimination of funding for the important environmental programs funded by the hydropower revenue noted above that protect current and future water use in Colorado. If Colorado and the other Upper Basin states violate the 1922 Colorado River Compact and fail to provide enough water to Lower Basin states, the West could be fighting over water in lengthy court battles and Colorado could be forced to prohibit some water uses. Western states could lose control of water to the federal government, Kuhn said, and Colorado would likely lose power in management of the Colorado River and water in the state. When asked about building an interstate water pipeline to solve some shortages, Kuhn said water managers have discussed pipelines of absurd lengths and he doesn’t think that method will work. “To expect that we can export our problems to somebody else, I just don’t see that somebody else will willingly accept them,” he said. The board of county commissioners works in the water arena in two major ways. First, to provide water locally to certain residential, agricultural and commercial customers and other projects that benefit the public generally such as the hospital development, environmental restoration and stream flow enhancement for environmental and recreational purposes. The county has a long tradition of appropriating and acquiring water resources to meet the current and future needs of its citizens. It has built an extensive water rights and water storage portfolio and has adjudicated a countywide augmentation plan that provides a legal water supply for out of compliance or new residential wells and other water needs. County water and storage rights in various reservoirs can be used as a replacement source for water used locally when more senior rights must be made whole. A majority ownership in the soon to be completed Old Dillon Reservoir will significantly add to the county’s water rights portfolio. 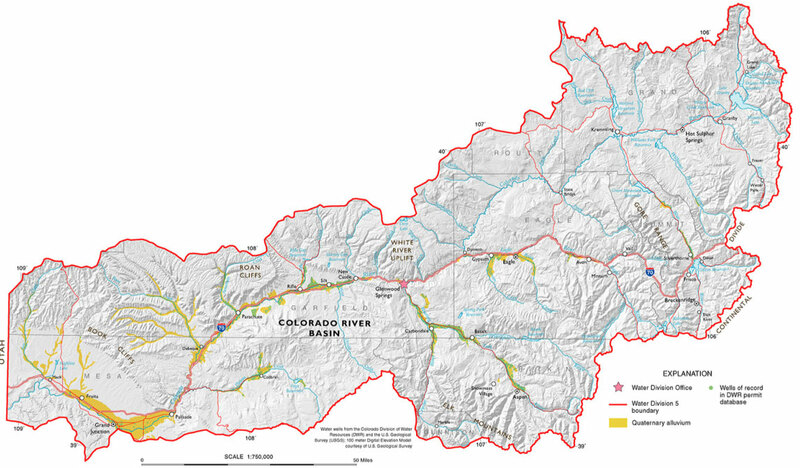 These water rights have assisted agricultural and ranching activities in the Lower Blue River Valley, the construction of accessory dwelling units to address critical housing needs, residential development, stream flow releases during low flow periods, the ongoing Swan River restoration project and snow making that can be critical to local ski areas and our local economy. Summit County Environmental Health Department protects surface and subsurface water quality through monitoring, testing and inspection programs. Secondly, the County Commissioners take a variety of measures to protect local water resources from further diversions outside the County. Approximately 30 percent of Summit’s native water is diverted east through the Continental Divide for use by Front Range water providers; Denver Water and Colorado Springs Utilities claimed and developed these water rights years ago. Summit County has been a leader in efforts to curtail the further exportation of water as well as efforts to address the impacts of these diversions. This has included years of litigation and negotiation with a variety of water interests throughout the state. Seven months into 2012, Greeley is still on pace for its hottest and driest year on record, according to figures provided by Wendy Ryan with the Colorado Climate Center, whose historical data goes back to 1968. For the year, the average temperature through the end of July was 56.4 degrees in Greeley, 3.7 degrees above normal, and precipitation had amounted to just 4.77 inches — not even half of the 9.81 inches that, on average, falls on the city before Aug. 1. 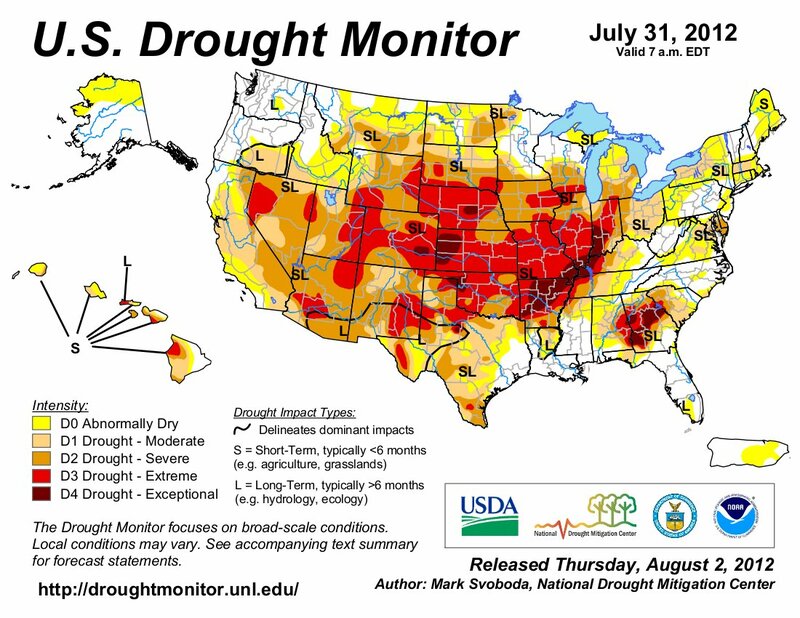 Along with the issues farmers and ranchers have faced, the hot and dry weather this year has forced municipal water officials to draw large amounts of water from reservoirs to supply residents trying to save their lawns. Jon Monson, director of the city of Greeley’s Water and Sewer Department, said July water demand for the city is usually about 15 percent higher than it is in June, due to the increase in temperatures. However, he said this year, the water-demand increase from June to July was only about 5 percent, thanks to the rains that arrived last month. Meanwhile, here’s a link to a photo gallery of xeriscape gardens from Apartment Therapy. Old Dillon Reservoir is fed by the Dillon Ditch, constructed at the same time as the reservoir to divert water from Salt Lick Gulch. Local entities will bypass some of the stream flow, allowing the water to continue downstream to where it sustains environmental features including beaver ponds and a wetlands area. More Old Dillon Reservoir coverage here and here. Old Dillon Reservoir enlargement update: Is a Golden Trout fishery in the future? The enlargement has been in the works for years as a partnership among local water users and the U.S. Forest Service, which manages the public lands around the reservoir. When water starts flowing into the new impoundment, it will help bolster water supplies for the town of Dillon, which depends in large part on stream flows from Straight Creek, running down along I-70 from its source along the Continental Divide. The stream is vulnerable to pollution threats from I-70. 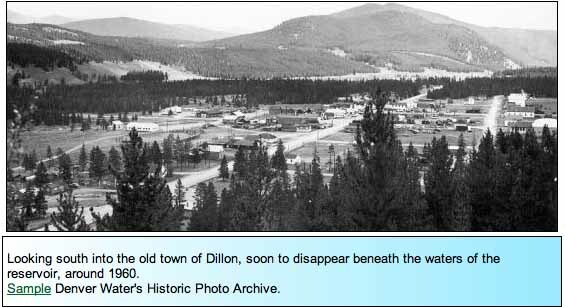 During the 2002 drought, Straight Creek flowed at perilously low levels, sending Dillon officials scrambling to develop a backup water plan that included direct diversions from Dillon Reservoir, as well as water-sharing with Silverthorne. Ewert said successful establishment of a golden trout fishery could give a little boost to Summit County’s fishing economy, drawing people from as far as Denver to try and catch a new species. 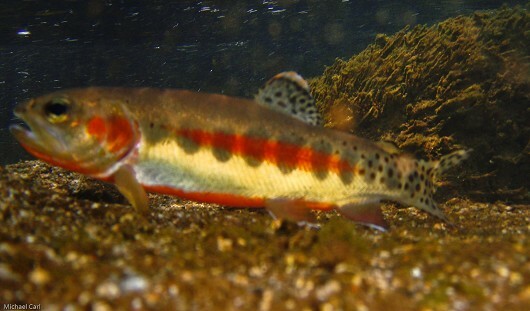 Since golden trout aren’t native, they are subject to any special protections, and Ewert envisions a put-and-take fishery, enabling anglers to take their catch home for dinner. Ewert said there are quite a few challenges associated with establishing the fishery, starting with getting the eggs from California, which isn’t a sure thing. The goldens mostly live in high mountain lakes and biologists have to hike in during spawning season to get the eggs, then pack them out. County officials have estimated the construction and preliminary soft costs like planning and design will total about $7 million, but they’re hopeful that the economic climate will result in some favorable bids that would lower the total cost. The county will pay for about 53 percent of the project, with Silverthorne kicking in about 8 percent and Dillon paying for the rest. Dillon stands to benefit significantly from the project. The town currently depends on surface water from Straight Creek, which is vulnerable to pollution from I-70. During the 2002 drought, Straight Creek flows dropped to a point that had Dillon thinking about direct diversions from Dillon Reservoir. The water in Old Dillon Reservoir could also be used to enhance stream flows in the Snake and Lower blue under other scenarios. The proposed expansion would enlarge Old Dillon Reservoir’s capacity from 62 acre-feet to 286 acre-feet by raising its north and south dams. The $7 million project would create new water-storage and water-supply capacity for the town of Dillon, the town of Silverthorne and unincorporated Summit County. All three entities project that demand for municipal water in their respective service areas will increase in coming years. 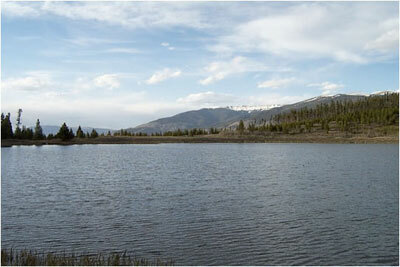 Old Dillon Reservoir was originally constructed in 1936 as a water-supply source for Dillon. The 14-acre reservoir is fed by water diverted from Salt Lick Gulch, just to its north. Salt Lick Gulch is a tributary of the lower Blue River. In 1963, Denver Water constructed the new Dillon Reservoir to supply drinking water to Denver, requiring the town of Dillon to relocate from its original location to its current one. Since the move, Dillon has been unable to use the water in Old Dillon Reservoir, but the town has maintained the reservoir and the water rights to it. In the spring of 2008, a culvert carrying water from Old Dillon Reservoir failed under Interstate-70’s westbound lanes, causing a portion of the highway to collapse. The culvert was replaced, but the Colorado Division of Water Resources ordered the Town of Dillon to drain the reservoir over concern for safety of its north dam. The reservoir is to remain drained until either the proposed expansion is conducted or the Town of Dillon reconstructs the north dam. More Old Dillon Reservoir coverage here and more Old Dillon Reservoir coverage here. Completion of the environmental analysis is a huge step forward for the $6.4 million project. The agency will take public comment on the environmental analysis for 30 days. Local officials hope to begin construction next summer. Dillon, Silverthorne and Summit County will share the cost of the project, which, first and foremost, would help bolster Dillon’s water supplies. The town relies mainly on surface water from Straight Creek, a source that’s susceptible to pollution. The town also felt a pinch during the 2002 drought, when Straight Creek flows dropped to record low levels. About 20 acres of wetlands would be affected by the reservoir enlargement, but the impacts would be addressed by adding new wetland on the southwest shorelines of the reservoir. In the long run, there would no net impact to recreational uses in the area, according to Paul Semmer, land specialist with the Dillon Ranger District. The enlargement of the reservoir would actually decrease total diversions from the Salt Lick Gulch drainage from 573 acre feet to 450 acre feet. The reservoir and dams would permanently impact 10.1 acres of forest and meadow habitat in the project area, according to the draft study. More Old Dillon Reservoir coverage here. Dillon’s town staff seeks to secure substantial funds from the Colorado Water Conservation Board for a project that will create water reserves for Dillon, Silverthorne and unincorporated Summit County. “We want to nail (the loan) down,” said Devin Granbery, Dillon’s town manager, noting that an emergency ordinance would put the financial agreement into effect right away. The town is moving quickly to access the loan because Granbery said he’s unsure if more money will be available for water projects in the near future. While Dillon sought a loan to pay for 90 percent of its portion of the expansion, Silverthorne and the county plan to pay for the project with reserved internal funds. Dillon will pay the remainder of its costs through its water fund. In all, Dillon must pay $1.7 million. The total cost estimate for the expansion is $6.3 million, and it will be shared proportionately between the three entities. The project will include reservoir enlargement, associated improvements, wetlands mitigation and rehabilitation of outlets to the reservoir. The U.S. Forest Service is still reviewing the project’s permit application — the reservoir is located on Forest Service land — and project bids could go out later this year if it’s approved. Construction is slated for 2010.